During my first visit to Paris in 1993, I was entranced by the serenity of Monet’s Water Lily canvases in the Musée de l’Orangerie in Paris, displayed on curved walls, according to his wish that the paintings encompassed the viewer. Through April 12, 2010, MoMA presents Monet’s Water Lilies, an installation that features the full group of late paintings by Claude Monet (1840-1926) in the collection for the first time since the Museum’s reopening in 2004. The four MoMA paintings are the mural-sized triptych (Water Lilies, 1914–26); a single panel painting of the water lilies in the Japanese-style pond that Monet cultivated on his property in Giverny, France (Water Lilies, 1914–26); The Japanese Footbridge (c. 1920–22); and Agapanthus (1914–26), the majestic plants in the pond’s vicinity. These works are complemented by two loans of closely related paintings—Water Lilies (1914–26), from the collection of The Metropolitan Museum of Art, and Water-Lilies, Reflections of Weeping Willows (c. 1918), from a private collection on extended loan to The Metropolitan Museum of Art. Monet’s Water Lilies is organized by Ann Temkin, The Marie-Josée and Henry Kravis Chief Curator of Painting and Sculpture, The Museum of Modern Art. Monet devoted the last 25 years of his life to the portrayal of the pond and its surroundings in Giverny. By the 1910s, his work centered on the creation of large-scale panels of the water lilies, a group of which he would donate to the French state for permanent installation in the Orangerie in Paris. After Monet’s death, many of these last works remained in his studio, left under the care of the artist’s son. But for two decades art historians and collectors reserved their interest for his earlier Impressionist work. The work of the 1910s and 1920s was regarded as far too unstructured, and much of the work left in the studio was considered unfinished. After the end of World War II, a sudden turnabout occurred, and keen attention was focused on Monet’s last paintings. In a quintessential case of contemporary art transforming attitudes toward earlier art history, the large scale and gestural freedom of Abstract Expressionism illuminated the late Monet as a predecessor of great relevance. In 1955 MoMA became the first public collection in the United States to acquire one of Monet’s large-scale Water Lilies compositions. The exhibition is accompanied by a small publication by Ann Temkin, with Nora Lawrence, Curatorial Assistant, Department of Painting and Sculpture, that recounts the history of Monet’s late works at MoMA, and focuses on their resonance with the art and artists of our time. Claude Monet: Water Lilies is published by The Museum of Modern Art and will be available at MoMA Stores and online at http://www.momastore.org. It is distributed to the trade through Distributed Art Publishers (D.A.P) in the United States and Canada, and through Thames + Hudson outside North America. Paperback, 6” x 8” / 52 pages / 40 illustrations. Price: $12.95. Wednesday, October 14, 6:30 p.m.
Ann Temkin gives a lecture on the exhibition and discusses MoMA’s role in helping to bolster the reputation of the Water Lilies in the 1950s and how contemporary taste can alter the reception of historical works of art. Tickets ($10; members, corporate members $8; students, seniors, and staff of other museums $5) are available online, www.moma.org/thinkmodern, or at the Museum at the lobby information desk or the Film desk. MoMA offers private group tours of Monet’s Water Lilies on selected Sundays during the run of the exhibition. Mornings with Monet include a light breakfast followed by a one-hour tour before the Museum opens to the public. The tours examine the life and work of Claude Monet with a close study of the exhibition and a look at related works in MoMA’s collection. Tickets to Mornings with Monet also include Museum admission for the day. The Mornings with Monet tours will be offered at 9:30 a.m. on October 18, November 8, and November 29. Tours will continue on selected dates, to be announced, through April 2010. Mornings with Monet are limited to 25 people per tour. Tickets are $75 ($65 for members). Check-in begins at 8:45 a.m. and includes coffee and croissants; tours begin at 9:30 a.m. For reservations, contact MoMA Group Services at (212)708-9685 or groupservices@moma.org. Museum Admission: $20 adults; $16 seniors, 65 years and over with I.D. ; $12 full-time students with current I.D. Free for children 16 and under. Free for members. Admission includes admittance to Museum galleries and film programs. Free admission during Target Free Friday Nights 4:00-8:00 p.m.
Lia Chang is an actor, performance and fine art botanical photographer, and a multimedia journalist. 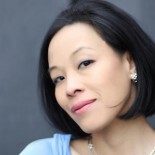 A former syndicated arts and entertainment columnist for KYODO News, Lia is the New York Bureau Chief for AsianConnections.com. She has been documenting her colleagues and contemporaries in the arts, fashion and journalism since making her stage debut as Liat in the National Tour of South Pacific, with Robert Goulet and Barbara Eden. She is currently working on several botanical portrait commissions for the New York City Health and Hospital Corporation Art Collection and on a book of portraits of her favorite Asian American men in the arts and space. This entry was posted on October 8, 2009 by Lia Chang in Art, Entertainment, Museum, New York and tagged Backstage Pass with Lia Chang, MoMA, Monet, paintings, Water Lilies.